Yes, the response to conserving the “Gateway to Walpole” with 1,000 feet of shoreline on the Connecticut River has been overwhelming and gratifying. There have been several individual donations in the thousands of dollars, and The Walpole Conservation Commission has committed up to $100,000 to protect this parcel for everyone forever. Now is the time that your $20 or more will add up fast to surpass the goal of $280,000. Below is an aerial view of what you are saving with your donation. 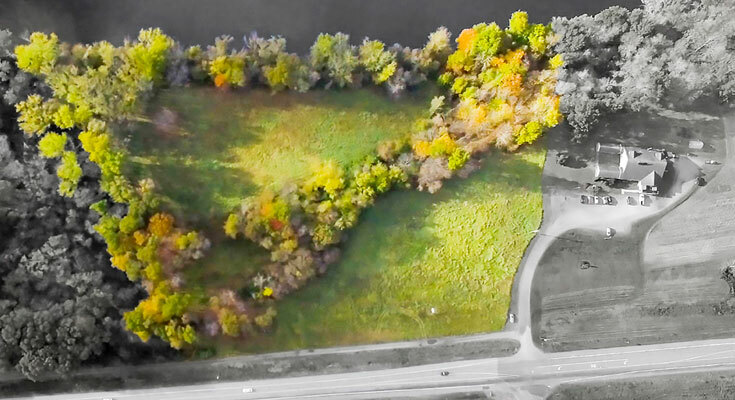 This three level parcel is colored in, and you can see the large field bordering the river. The tree line on the left is a precious ravine, teaming with nature for exploration. The fields offer many recreational opportunities, and a precious aquifer lies underneath all.